"Ink, Image, Impressions: Italian-American Printmakers of the 20th Cent"
Ink, Image, Impressions: Italian-American Printmakers of the 20th Century, March 16 - May 15, 2001. Works on loan from The Old Print Shop, New York City. Curated by Michael Di Cerbo of The Old Print Shop, Carol D. Jones and Meredith Noll (students in the Graduate Program in Museum Professions), Dr. Petra Chu (Faculty Advisor), and Jo Ann Cotz (Gallery Director). Sponsored by Primavera Festival 2001, The Joseph M. and Geraldine C. La Motta Chair in Italian Studies, the Department of Art and Music, the Department of History, and the Department of Modern Languages. This exhibition illustrates the wide variety of subjects, forms, and pictorial effects that can be found within the art of printmaking. The show is comprised of fiftyone prints, produced by eight artists whose careers span from the 1920s to the present. All share a common ancestry in Italy and a love of the printing process. 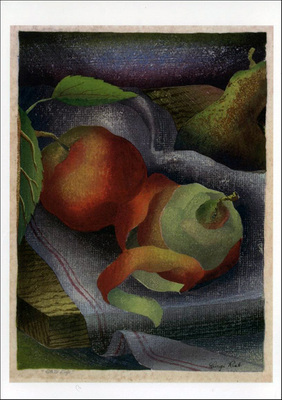 However, their similarities end there as these artists use different print techniques and are attracted to subjects ranging from nudes and figurative scenes to landscapes and still lifes. Indeed, if their works have anything in common, it is the prevailing adherence to representational art.